Make fast work of getting currants off their stems with this hack for how to de-stem currants quickly. Plus some extra tips and yummy recipes to try! I’m a huge lover of tart fruits, so fresh currants are one of my favorites! I’ll eat them right off the bush! For most people, though, currants are most enjoyed in something else; like jam, desserts, or even dehydrated. 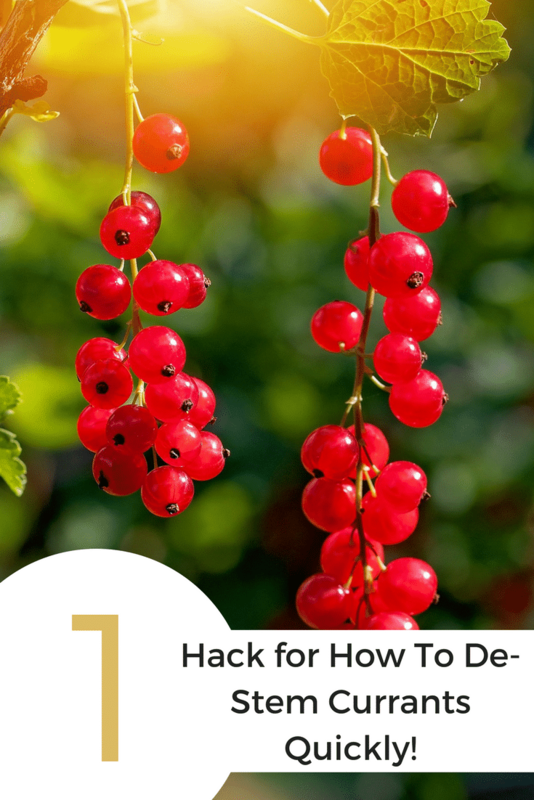 No matter how you plan to enjoy them, save yourself some time and energy with this great hack for how to de-stem currants quickly! If you live in a region where currants grow easily, you know that 2-5 pounds can show up on a bush at any given time. Getting them off the bush is simple because the stems are so tender, but getting each individual berry off of the stem can take significantly more time. By using today’s hack for how to de-stem currants, you can take an hour’s work and get it done in fifteen minutes! All you need is a large bowl or measuring cup, and a sturdy dinner fork. Twelve ounces (3/4 lb.) of currants yields roughly 2 cups. To de-stem currants quickly, hold a single stem of currants by the top of the stem and place it between the tines of your fork. Place a bowl under your currants and run the fork down the stem of the currants using a small amount of pressure. This will pluck the currants off of the stem quickly and with one movement instead of removing each individually by hand. Rinse and dry your currants before you de-stem them. Using this method occasionally breaks apart the currants, so rinsing them afterwards may wash away or water down some of the fruits. Black currants tend to be a bit larger than their red, white, or rose counterparts. You may need a little extra pressure to extract them from the stem. If you apply too much pressure, the currants may bounce out of your bowl. Placing a paper towel in the bottom of the bowl will help with this. Double check for the small stems! While this hack works wonders, it won’t get 100% of the stems every time (but darn close!). If you’re going to be baking or serving your currants, make sure to sift through the bowl for any with stems still attached. What are your favorite things to make using fresh currants? Do you have any favorite hacks for getting them off their stems? Tell me about it in the comments or show me on social media – @foodabovegold. If you used this post to help you a currant de-stemming master, send it to me or tag it with #CallMeMichelin and #foodabovegold for everyone to see!